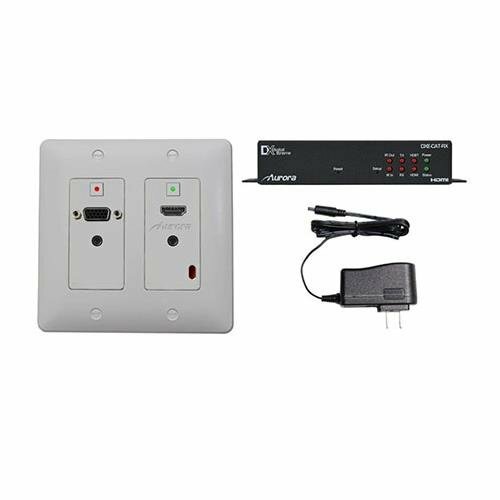 The Aurora Multimedia DXW-2-S1 230' One Room - One Cable White Kit which includes a 2 gang multi-input decora style transmitter with HDBaseT CAT extension and a DXE-CAT-RX1 HDBaseT Receiver. The DXW-2 2-Gang HDBaseT Wall Plate Transmitter installs into a standard 2-gang outlet box and functions as a switcher, converter and extender. It converts VGA or HDMI to HDBaseT and transmits it up to 600' to a compatible receiver (sold separately). The HDBaseT output is on the rear side and a single CATX cable runs from it through a wall to the receiver. The transmitter is powered remotely from the receiver via the HDBaseT connection or locally via an optional PS0080-1-US power supply. The DXE-CAT-RX1 extender features single-sided connections for HDMI, control and power to provide a clean wiring and rack mounting solution. The Patents Pending design allows the system to be powered via an AC adapter from either side. With a single CAT 5e/6/7 cable, the DXE-CAT-RX1 receiver be located at up to 230' away. The kit includes a 24VDC power supply for the transmitter unit as well.